I have just completed a pair of Baselards shown below. Baselards were in two distinct styles. 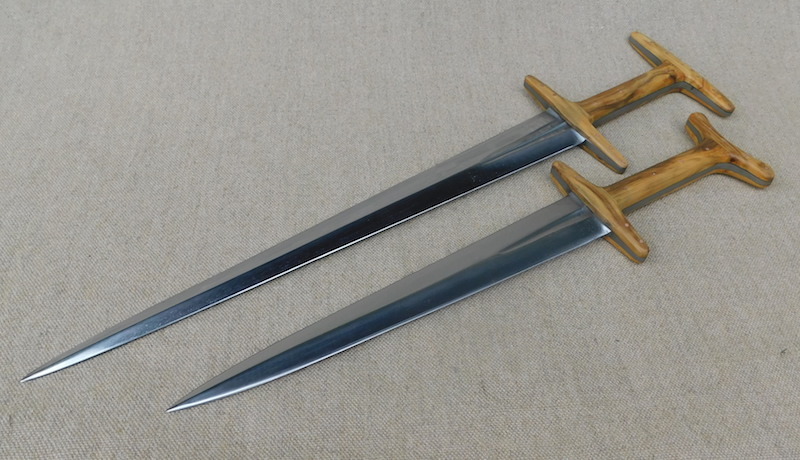 The German/Swiss style is often known as the 'Holbein' dagger style and is of the form that was favoured by the Nazis. The other style was very popular in Italy, but also in France and England and I guess but don't know, Flanders and Holland. 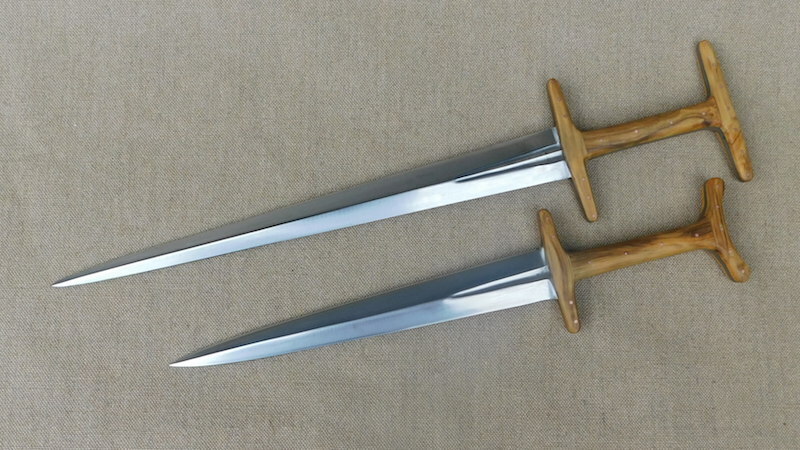 These two daggers are of the Italian/English style of Baselard. The shorter is styled after Italian pieces from the first part of the 14thC and has the slightly upturned upper guard that was quite common at the time. 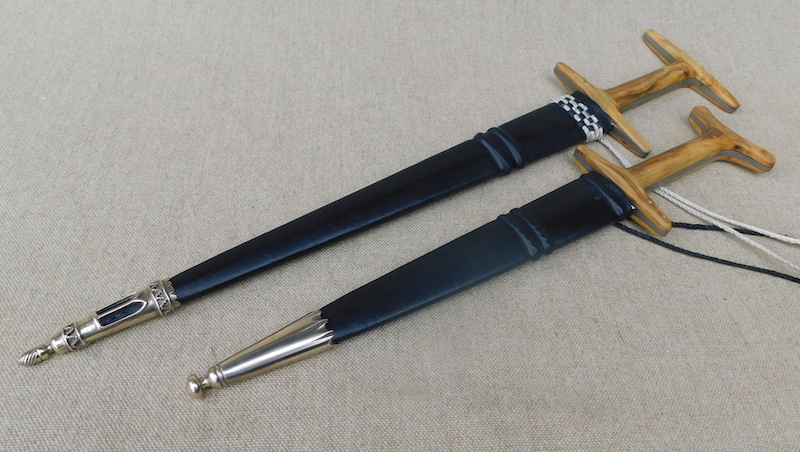 The longer dagger is very closely based on an iconic piece from the Royal Armouries and is a little later in date and if I remember correctly may be French. Both pieces have scales made from spalted box and soaked in linseed oil and held with copper rivets. The blades are 6mm/1/4" thick at the guard and the tangs taper down from there. Both sheaths are made from two layers of veg tan leather, dyed black and finished with bronze chapes. The smaller piece is a commission and the larger is available for sale. Oh my, they are both beautiful. The owners are very lucky. Love that work!!!! I purchased one similar to the longer one from Tod a while back in 2014 and I'm very happy with it: The blade is fairly stout but not overbuilt. As always top quality work from Tod, and always a good customer service experience buying form him from his regular production and also a great experience with custom orders meeting all expectations about estimated delivery times, and good communication as one can read in the linked Topic above. Nice work as always Tod. 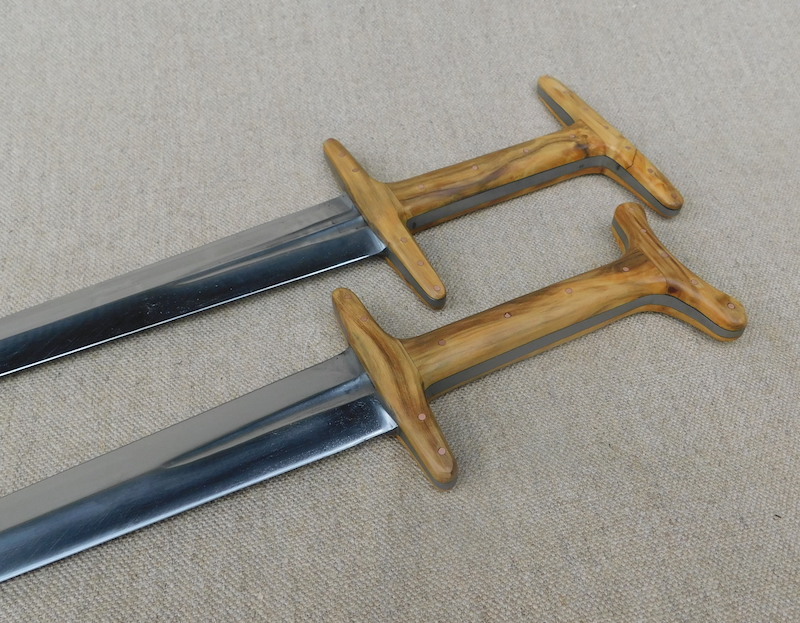 I've been curious about the period manufacture of baselards - was the lower guard a separate piece, fitted like the cross of a sword, or was the whole knife forged as one piece? If the latter, I'm curious how one would do that - chisel some wings and bend them out 90 degrees from the tang? I would forge weld a piece 90° to the tang and then taper it but your suggestion would also work. Being a huge fan of the Ljubljanica River sword (the sword that the Albion Ljubljana is based on), the double fuller on the Royal Armouries example is highly appealing to me! Great work yet again Sir Todeschini! I am not certain, but pretty sure that there were two ways of doing it. Some had a separate bottom guard and usually an separately fixed (welded or brazed) top guard made of a folded strip. Others were of one piece. Whether this one piece was welded pieces or cut from a larger piece I cannot say and I am sure they did both. However, if you look at the Leeds example, so basically the profile of the longer one here, the arms of the guard, were they to be folded back would pretty much fill along the handle sides, so I would think the blank was formed to include the arms, they were then cut, folded out and had the thickness reduced a little, holes punched and voila.